These rules may be called the “Telangana State Media Accreditation Rules, 2019”. These rules shall apply to grant of accreditation to the Media Representatives at the State Level and in the Districts of Telangana State. “Accreditation” means the recognition of a Media representative by the Government for the purpose of access to all sources of official information in the Government. “Accreditated Media Representative” means the Media Representative who has been granted accreditation in accordance with these rules. “Bureau Chief” means the Head of the Bureau of a Newspaper or Periodical or News Agency or Satellite News Channel or Cable News Channel at State or District Level. “Cable News Channel” means a cable television network registered under Cable Television Networks (Regulations) Act, 1995 having at least 3 news bulletins of 30 minutes every day. “Committee” means the State or the District Media Accreditation Committee. “Editor” means the person who is declared as Editor of Newspaper/ Periodical / News Agency / Satellite News Channel / Cable News Channel. l. “Electronic News Media” means Satellite News Channel or Cable News Channel. “Government” means the Government of Telangana. The news unit of Doordarshan, All India Radio, Press Information Bureau, News Reel Unit and periodical of Government of India. The Publicity Cell, Media Relations Section, Photo Section, Publication Section, Video Unit, News recording unit, Periodical unit, PR wing and Information Engineering wing of the Information and Public Relations Department. The News Unit of the Telangana State Film, Television and Theatre Development Corporation (TSFTvTDC). Reporter, Desk Journalist, Photographer, Cartoonist, Sports Correspondent, Cultural Correspondent or Film Correspondent representing any Newspaper, Periodical, News Agency. Television and Theater Development Corporation. Correspondent, Film Correspondent of any Electronic News Media. “News Media” means the Newspaper or Periodical or News agency or Electronic News Media. “Medium Daily” means Newspaper having circulation between 25,001 to 75,000 copies per day or as decided by the Registrar of Newspapers of India from time to time. “Periodical” means ‘weekly’ or ‘fortnightly’ or ‘monthly’ containing news of public interest other than caste based and religion based periodicals having a circulation of at least 2,000 copies per issue in the State. “News Agency” means the ‘News agency’ dealing with News of Public Interest and supplying the same to Newspapers / Periodicals / Electronic News Media. “Satellite News Channel” means a News and Current Affairs TV Channel broadcast through satellite in India and approved/permitted by the Ministry of I&B, Govt. of India and having at least 50% of the content as news. “Working Journalist” means any journalist as defined in the Working Journalists (Conditions of Service and Miscellaneous Provisions) Act, 1955 & as per the recommendations of Majithia Wage Board and as amended from time to time. “Notice” means seven days notice in advance to the members of the Accreditation Committee prior to the date of meeting. In case of emergency 48 hours prior intimation to the date of meeting. “Quorum” means a minimum of half of the total members of the Accreditation Committee. The term of the said committees is two years from the date of appointment. However the Committee shall continue to function till a new committee is constituted. The Committee shall meet once in three months or as and when necessary. In case of resignation or death of a member, the vacancy shall be filled with an alternative member, by obtaining nomination from the respective body or by getting nomination from the nominating authority, as the case may be. Accreditation may be given in accordance with the rules to the Editors /Media Representatives at the State level and in the Districts as recommended from time to time by the Committee concerned. The members of the State Media Accreditation Committee shall also be given accreditation at State level. When an accredited media representative ceases to represent the media organization on whose behalf he /she is accredited or when the Newspaper or Periodical or News agency or Electronic News Media ceases to function, the fact shall be brought to the notice of the Commissioner /Collector in writing within (fifteen) 15 days by both the representative and the Editor /Bureau Chief and the accreditation card shall be returned to the Commissioner or the Collector. If the representative fails to surrender the accreditation card within three months from the date on which he /she ceases to represent the organization, he /she shall not be extended the accreditation facility for a period of two years, even if he /she represents any other organization subsequently. 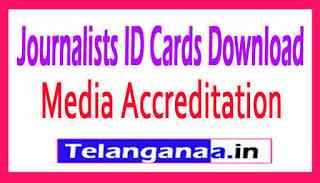 If any accredited Media representative ceases to represent the media organization and fails to surrender the card, the organization also should be made accountable and the Media organization shall not be issued another card applied in place of the un surrendered card, even if the organization is eligible otherwise. The period of accreditation for the Media Representatives at the State Headquarters and at District shall be for two years. Officers of any Department authorized by the Commissioner or the Collector shall be permitted to cross check the circulation and other details of the Newspapers /Periodicals /News Agency /Electronic News Media. The Members of the Committee authorized by the Commissioner /Collector shall be permitted to make surprise and random checks to verify the circulation and other details of the Newspapers /Periodicals /News Agency /Electronic News Media. A daily newspaper having RNI Certification and a minimum circulation of 2,000 copies is eligible for accreditation to its Representatives. The minimum size of the daily newspapers for accreditation eligibility shall be as mentioned in the Schedule A to E.
A daily newspaper shall be published not less than 6 (Six) days in a week. shall be considered only after empanelment with Commissioner or after completion of six months period from its date of commencement whichever is later. No daily Newspaper shall be extended accreditation facility without Registrar of Newspapers of India registration number. The Big and Medium Newspapers shall submit Audit Bureau of Circulation or Indian Readership Survey Certificate in support of the circulation claimed and the Chartered Accountant Certificate shall not be accepted as proof of circulation. However, the Committee may consider the Chartered Accountant Certificate as proof of circulation in case of new dailies for a maximum period of three years from the date of commencement. The Small Newspapers shall submit either Audit Bureau of circulation or CA certificate as proof of circulation. The entitlement of number of accreditations at State and District Headquarters for big, medium and small dailies shall be governed by the criteria mentioned in Schedules A to E appended.